The Election Commission had Monday barred the two leaders - as well as UP Chief Minister Yogi Adityanath and BJP's Maneka Gandhi - from campaigning for varying periods over violations of the moral code of conduct. Akash Anand, the Bahujan Samaj Party (BSP) chief's nephew, was finally heard today in Agra. BSP chief Mayawati's nephew and SP leader Azam Khan's son on Tuesday filled in for the two Uttar Pradesh heavyweights on Tuesday, the final day of electioneering for the second phase of polling in the state. Yogi Adityanath prayed at a Hanuman temple in Lucknow, a day after the Election Commission issued the order frowning at his ''Ali-Bajrang Bali" remark, seemingly framing the election as a contest between Hindus and Muslims. Campaigning for the second phase of Lok Sabha elections in Uttar Pradesh ended on Tuesday evening. Yogi Adityanath followed the EC order, keeping away from the meetings he was scheduled to address in second-phase constituencies of Nagina and Fatehpur Sikri. Instead, Yogi Adityanath prayed at the well-known Hanuman Setu temple in the state capital, refusing to interact with other worshippers. But her nephew Akash Anand delivered his first political speech there, watched on by SP president Akhilesh Yadav, Rashtriya Lok Dal chief Ajit Singh and BSP's SC Mishra. "People in such large numbers have come here on the appeal of my aunt, for which I am thankful," he said. 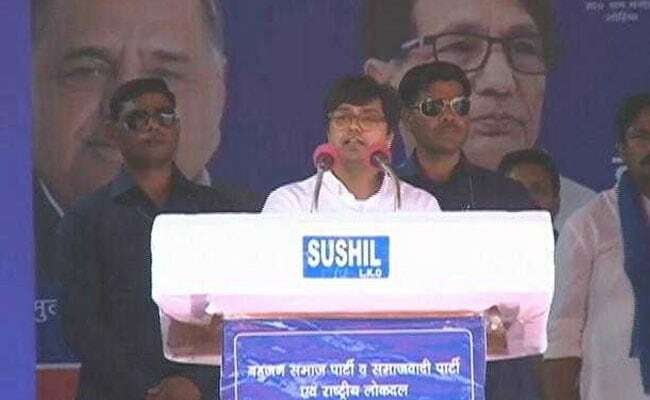 He said the victory of the alliance candidates will be a "proper reply" to the Election Commission, ending his brief address with the ''Jai Bhim, Jai Bharat" slogan. Akash Anand is the son of Mayawati's brother Anand Kumar and had begun appearing in public with her, but not as a speaker. While Azam Khan didn't campaign on Tuesday following the EC reprimand, his son Abdullah courted controversy by claiming that the leader was targeted because he is a Muslim. The EC had ordered Azam Khan to suspend his campaign over a "khakhi underwear" jibe at BJP candidate Jaya Prada. "No action was taken when the BJP candidate stated on Twitter that she is coming to Rampur to bring an end to the regime of a demon," Mr Abdullah told reporters in his father's constituency. He maintained there was no mention of her in his father's speech and he has been barred "only because he is a Muslim". Mr Abdullah termed the gag order an attempt by the EC to please the Bharatiya Janata Party after the poll panel banned Yogi Adityanath from campaigning. The EC had taken objection to Yogi Adityanath's remark suggesting that while the BSP and the SP had faith in Ali, the BJP believed in Bajrang Bali, or Lord Hanuman. Yogi Adityanath, barred from campaigning for 72 hours, had also called the Indian Union Muslim League in Kerala a "green virus".